234 pages | 81 B/W Illus. 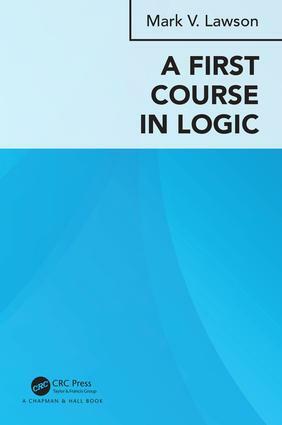 A First Course in Logic is an introduction to first-order logic suitable for first and second year mathematicians and computer scientists. There are three components to this course: propositional logic; Boolean algebras; and predicate/first-order, logic. Logic is the basis of proofs in mathematics — how do we know what we say is true? — and also of computer science — how do I know this program will do what I think it will? Surprisingly little mathematics is needed to learn and understand logic (this course doesn't involve any calculus). The real mathematical prerequisite is an ability to manipulate symbols: in other words, basic algebra. Anyone who can write programs should have this ability. In academia, basic logic is seen as both a skill that must be mastered by all, and as a topic that is hardly taught to anyone. As a skill, logic offers various techniques for evaluating the truth or the falsity of a statement. As a topic, logic offers insurance that these techniques are valid and, if possible, complete. In his book, Mark Lawson proposes a pleasant journey in both directions. Following a tradition that dates back at least to the ancient greeks, plenty of everyday life examples are proposed throughout the book for initiating, developing, and confirming our capacity to use logic as a skill. As additional examples of logic at work, most major known facts concerning basic logic as a topic are also carefully and incrementally presented. Mark V. Lawson is a professor in the department of mathematics at Heriot-Watt University. Dr. Lawson has published over 70 papers, and has written four books. His research interests focus on algebraic semigroup theory and its applications.